Dill Pickle Design: Guestbook - Sign Here! Guestbooks sometimes feel like old relics of weddings past with just a plain cover and lined pages to write your name, but there are so many new ways you can have your guests leave you well wishes. I wanted to do something creative and unique with our guestbook and I found tons of ideas. I thought of using recipe cards and having guests write a message to us and stick it in a recipe box (we love to cook) and I thought about doing a family tree scenario where guests created a leaf with their thumbprint and wrote their names on branches (kinda a mess). Ultimately, we went with something much simpler, but still creative and meaningful. These days an engagement shoot is standard practice with a wedding photography package. We chose our first photographer (yeah, I said first) very early on in the process. We did an engagement shoot with him in November 2009 and we used the pictures on our Save-the-Date postcards. Then in January 2010 he informed us that he would be having back surgery in the fall and needed to cancel on us (stress!). So we searched again and found our 2nd photographer about a month or so later (thank goodness!). It turned out for the best as we LOVE Vic and got to do another engagement shoot with him. We wanted to be able to use those pictures in a fun way, so we created a photo engagement book on Shutterfly. The picture on the left is the front cover and the picture on the right is one of the pages. My husband created the photo collage pages in Photoshop and uploaded them to Shutterfly. We left a blank page on the opposite side of each photo page for people to sign and write us messages. 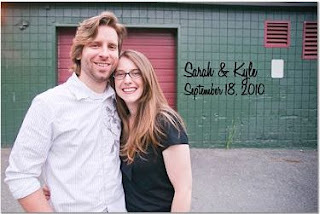 This way we are able to enjoy both our engagement photos and the messages our friends and family wrote to us. To make sure guests knew that they were to write in this photobook, I created a sign in the same manner as the table numbers. We highly recommend purchasing photobooks from Shutterfly. My husband created an album of our wedding photos using the same collage technique as our guestbook and they turned out fabulous. They are such a wonderful keepsake at a reasonable price and no dealing with individual photos. 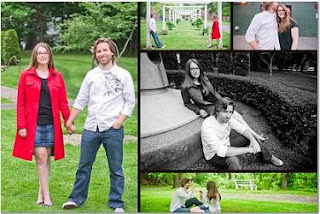 Engagement Photos by Vic Pellicier @ Pellicier a.p.d.